The audience erupted in applause on the evening of Friday, June 30, 2017, in response to a private screening of the film Gosnell at the 2017 National Right to Life Convention (NRLC) in Milwaukee, Wisconsin. The film about convicted abortionist Kermit Gosnell was, for many, the pinnacle of the annual event, which was held this year at the Hyatt Regency. Producer Ann McElhinney has relied solely on the financial support of the pro-life community to keep the film alive. “You are my rock stars,” she told the NRLC audience. McElhinney, who was one of many prominent pro-life speakers in attendance, further discussed the gruesome details surrounding the case and emphasized the need for people to see and support the film. “The culture is dominated by death,” McElhinney said. “We will get this film out. It will happen.” Its potential release next year could prove a pivotal moment in the fight for life. Other keynote speakers included David Daleiden of the Center for Medical Progress, Ryan Bomberger, Wisconsin Gov. 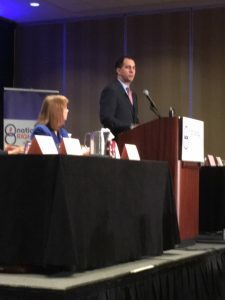 Scott Walker, and political author and commentator Ben Shapiro who opened the convention. 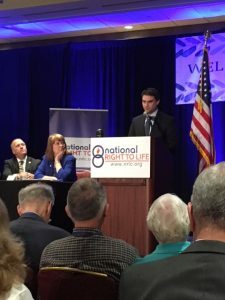 Numerous NRTL leaders and directors also spoke about achievements and challenges facing the pro-life community. Lake County Right to Life joined its many affiliates across the nation as part of a three-day collaboration to celebrate and strategize pro-life work. The event took place June 29 –July 1, 2017. Topics addressed included legislative goals, personal testimonies, and the growing threat of legalizing euthanasia, or what many falsely refer to as “death with dignity.” Participants also had the opportunity to enhance their skills and knowledge by learning from experts on a particular subject. Branding, lobbying, and social media usage were just some of the topics discussed in the many workshops held to better equip those who are on the front lines everyday fighting for life. Click Here to help support the film Gosnell.